One of my goals for 2017 was to learn 12 new things – an average of one per month. In January I learned some basic toilet repair. In February I learned nothing. Ok, I probably did learn some stuff, but just stuff that I would have learned anyway even without this goal (I learn new stuff at work all the time – it’s sort of the nature of my job). So to make up for it, I’m going to learn two new things in March. I’ve already started on the second thing – it will be a longer blog posting on another day (and it’s way more interesting than the thing I’m about to talk about). But tonight I decided to tackle learning how to fold a fitted bedsheet! 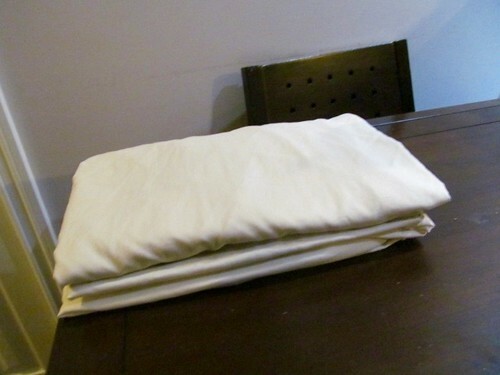 Usually I just sort of roll it up and stuff it in a pillowcase with the much more nicely folded flat bedsheet (and then leave it on the bed for the cleaning lady to change the sheets). And I usually do this on the morning of the day the cleaning lady is coming (and up until that day, the sheets have been sitting, unfolded, in the “clean” laundry bucket mixed in with all the other laundry I haven’t bothered to fold. Because I have more interesting things to do in life that be a responsible launderer. But then it’s always kind of bugged me that I was being shown up by fitted bedsheets. Surely I could master folding those things right? And on those rare occasions when I actually did fold my laundry, I’d end up with a big lumpy pillowcase in my linen closet. Boo-urns. So tonight I decided to actually just learn how to do it. I’m pretty much Martha freaking Stewart. Nice! This is how I do it now too…but mine don’t look nearly as nice as yours. I learned from my mom who learned from my cousin (semi-recently, maybe 5-6 years ago?). It has definitely reduced my laundry folding aggravation! Fitted sheets are why I only own one set of sheets. We wash them and put them back on, no folding needed (and I do wash them once a week). When they wear out, we buy a new set. So, nicely done!